For some time I’ve been wanting to try using QR codes in my library, for book recommendations as well as for instruction. Everyone says it easy, but I’ve been scared. Why? I guess because I use my laptop all the time, but not an iPad, or other handheld device. I have found things I wanted to use, and find that no link was present for a laptop, only a smartphone or tablet. However, my entire district is going 1:1 as we speak and there will be iPads running around everywhere. QR stands for “Quick Recovery”. QR Codes were invented for use in the Japanese auto industry. QR Codes are a replacement for URLs and text, making it easy for anyone to get to the correct location on the web. Isn't that cool? 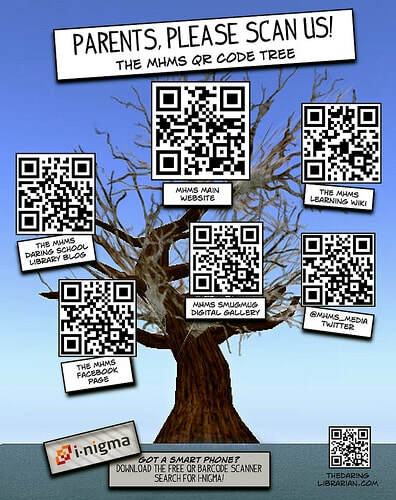 I made this QR Code with QR Generator, which is mentioned in "Using QR Codes in Your Classroom" on Rachel Lynette’s Minds in Bloom blog as the author’s favorite generator. 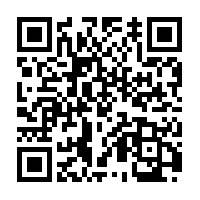 Here is a QR code for that simple, short, not too scary article. However, to do anything with it, you also have to have a QR Reader, right? Right. Educational Technology and Mobile Learning gave Scan this review: "Scan is the fastest and most user-friendly QR reader and barcode scanner available. If your iPhone (or iPod Touch/iPad*) came with a built-in scanner, this would be it! Check out our site at http://scan.me to create and manage your own QR codes for free." Well, I’m not an iPad user – yet. I know I will have to be soon. When I went to download Scan, first I needed to download iTunes for iPad. That page had a link to email myself the link to download iTunes,which led straight back to the page I started on. Several times. Anyway, I do know how to use Pinterest. I’m a Pinterest junkie. Pinterest is an absolute candy store for teachers and school librarians. 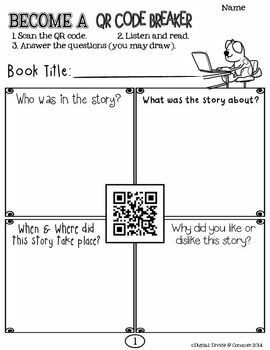 Below are some of the goodies and ways to incorporate QR Codes in the library that I found. This is from Library Voice, blog of the lovely and talented Shannon McClintock Miller. For this activity, students wrote and presented booktalks in their classroom. Then during library time, they created digital booktalks using Camtasia Relay. Shannon Miller really does some awesome stuff. ​This is a fun little freebie from Teachers Pay Teachers, but it would be easy enough to do your own. 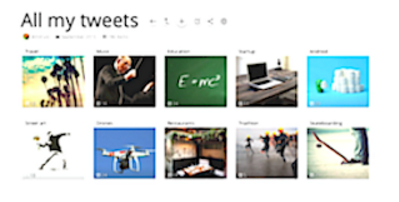 You could extend it to websites, images, video and more. 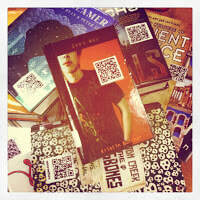 Jennifer LaGarde, aka Library Girl, has a lot of ideas for using QR Codes on her blog. Paste the QR Code right on the cover of the book. It could lead to a review, synopsis, or book trailer. LaGarde says “ the first time I saw a group of students huddled around the computer taking a 360’ tour of the Sistine Chapel that was linked (via QR Code) to a book on Michelangelo, (which they then fought to check out), I knew I’d hit on something big.” She even has a bookmark inviting students to match up books and websites. ​Here's an example. Do you ever struggle to get parents’ attention at open house? This is a great way to inform parents about your library program found on Gwyneth Jones’ The Daring Librarian blog. Each QR Code leads to a different aspect of the library program, i.e. website, twitter account, facebook page, etc. I would probably use it to share activities we have done in the library, such as Reading Bowl, MakerSpace, and Read Across America. Okay, that does it. I'm not scared anymore. I can't wait to go and try this out! Shannon Miller authors and has authored a ton of blogs including one in partnership with John Schu, Mr. Schu or @Mr.SchuReads as you may know him, called Two Libraries One Voice. What a great way for two librarians to form a brainstorming laboratory and share their ideas with the world. Mr. Schu also has a great blog on using book trailers called Watch. Connect. Read. I had the privilege of hearing Shannon Miller speak last summer at GMLA's Summer Institute. She is indeed a mover and shaker, and involved in so many projects and honors that I'll just give you a link to check out: About Shannon. Okay, I will share just so you can be amazed. Shae and Shannon's Rocking Review Corner! 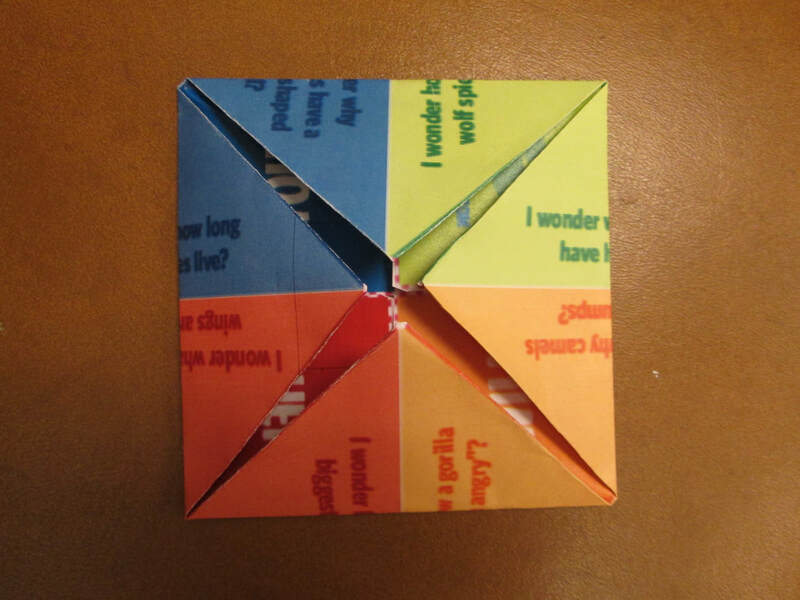 This is an idea for a Cootie Catcher, okay- a Fortune Teller, it's just so much more fun to say "Cootie Catcher" - to use with Pebble Go that I found on Miller's blog. I tried this with several classes. 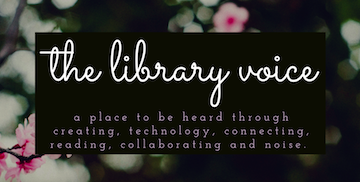 Her last post on The Library Voice was about using Buncee to create library branding, promotions and signage. An older post is about connecting two schools in two different states using Web 2.0 tools and social media. Shannon teaches us about reaching out beyond the confines of our classrooms and schools. For example, after sending out a tweet looking for special education teachers to collaborate with, she ended up connecting with the superintendent and an elementary technology teacher. They used Skype, Storybird, Google Interactive Maps, and Glogster using a Connect Wiki to connect their two schools. That was in 2011. Shannon Miller is all about making connections and forming relationships. There is a lot of love in her voice and I view her not just as a librarian, but also a peacemaker. Check out Miller's blog archive on the lower right menu to be amazed. So far this year, she has 82 posts, 41 in February alone. Last year, she shared 391 blogposts. I'm out of breath just thinking about it all. She is now an international speaker and consultant. 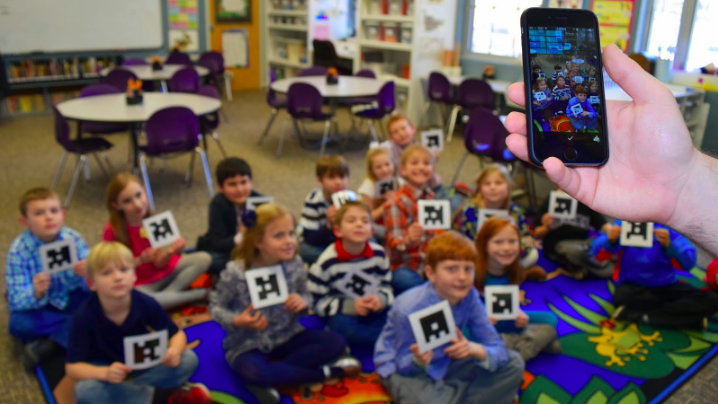 Plickers is a remarkably easy-to-use app with endless possibilities. 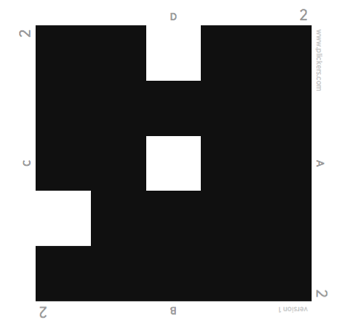 ​Versions are available for iOS and Android. 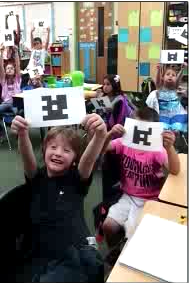 Laura Candler's "Plickers 101: Plickers Made Easy Webinar" is a clear, concise tutorial and a great place to start. 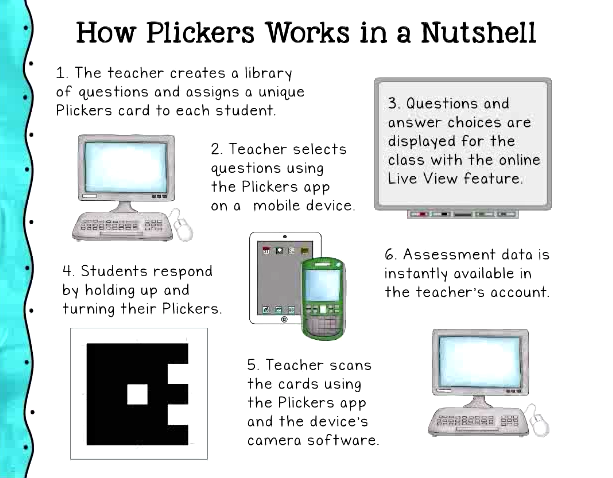 Install the free app from the Plickers website, Plickers.com and while you are there, download a set of cards. There are several types available, but a basic set consists of 40 cards, with two cards on a page for printing purposes. Students use the card to answer a multiple choice or true/false question by turning the card so their answer is on top - A, B, C, or D.
The number on the card corresponds to the student, so this card would belong to Student #2 and her answer is D.
You could even get students to leave their card in a desk so they can whip them out anytime for instant feedback. Definition #3 of 10 for standard, according to Merriam Webster, is "something established by authority, custom, or general consent as a model or example." In a lot of disciplines, standards are clear. Chemistry, physics, mathematics, and sciences in general have clear and established standards. Our field is much more nebulous. transitory, changeable, malleable. It hasn't always been this way, but the World Wide Web has changed everything about information and communication. And it's still cascading down an avalanche, skyrocketing through the clouds as it changes virtually everything about the world in which we live. Enter the librarian, media specialist, information professional - we don't even know what to call ourselves anymore! Sometimes I envy classroom teachers. Their curriculum is developed and prescribed by state governments, state education departments, local boards of education, and lessons are handed to them by literacy and math coaches. They know all too well exactly what they are supposed to do. Okay, I don't really envy them, not even one little bit. Sometimes I just get overwhelmed by all the possibilities. There's a reason I do what I do, many reasons actually. I like variety, surprise, challenges, puzzles, and I absolutely love helping my students become skilled, independent consumers and producers of information. It's just that the sky's the limit, so where do I start and how far should I go? It's no wonder there are so many different types of standards for what we do. For the state standards, the Georgia Performance Standards, I pick through the subject areas to find skills that fit under my umbrella. I glean from other state's standards. One of my favorites is from the New York City DOE. They have developed the "Empire State Information Fluency Continuum" for K-12, aligned with Common Core State standards. It's a beautiful thing and draws heavily on the AASL standards. The introduction includes this diagram of the Stripling Model. I agree that the AASL Standards need to be updated to include technological advancements. However, I have used them well, often relying on the AASL Crosswalk to help me align my instruction with other areas. The AASL Crosswalk, published by ALA in 2011, aligns AASL standards with the Common Core, and it's oh so handy. The only thing is that it doesn't mention technology, and we all know that technology is a big chunk of what we do now. Enter the ISTE Standards. The copyright on the ISTE Standards reads 2016. Just to download their standards, you have to let them know what you plan to do with them, so there's a professional sense of ownership. While the ISTE Standards don't address other curricular areas, they are skill-driven and exciting. Kind of an Eagle Scout program for people like us. Ponder this statement of purpose from the ISTE Student Standards page. 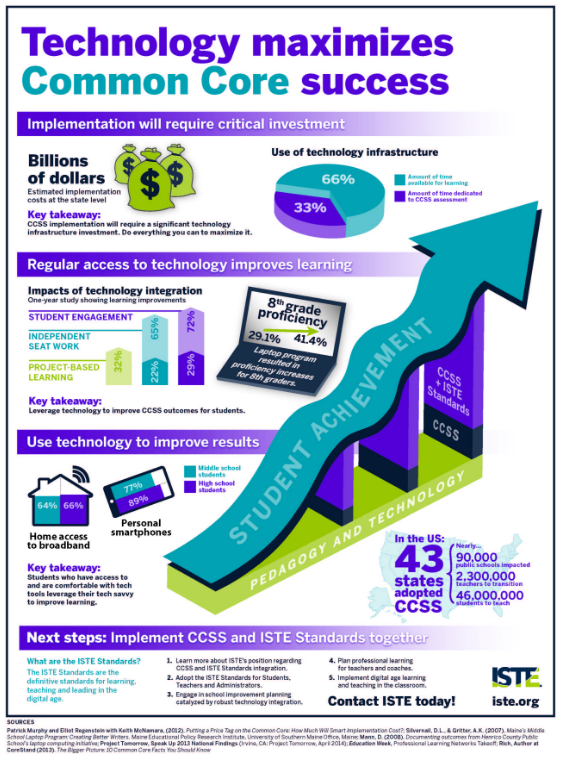 The ISTE Standards for Students are designed to empower student voice and ensure that learning is a student-driven process of exploration, creativity and discovery no matter where they or their teachers are in the thoughtful integration of ed tech." 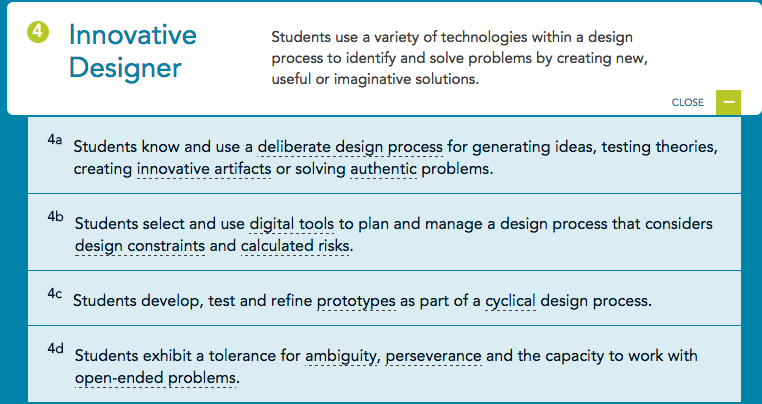 "The 2016 ISTE Standards for Students emphasize the skills and qualities we want for students, enabling them to engage and thrive in a connected, digital world." ISTE has also identified how the ISTE standards support the Common Core. Something about the ISTE Standards is totally exciting to me. Although the AASL Standards are near and dear to my heart, I don't want to jump up and cheer when I read them in the same way I do when I look at the standards. 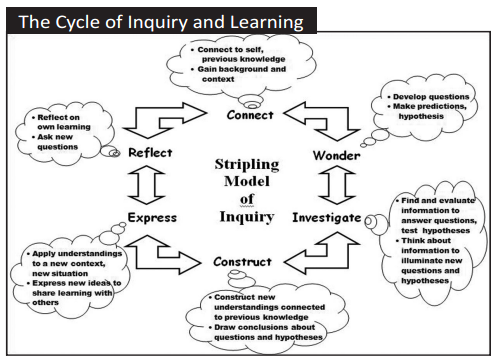 "Follow an inquiry-based process in seeking knowledge in curricular subjects, and make the real world connection for using this process in own life." "Students critically curate a variety of resources using digital tools to construct knowledge, produce creative artifacts and make meaningful learning experiences for themselves and others." Can you tell which one is ISTE and which one is AASL? There's a subtle difference in the paradigm behind these. Click on the links to find out their origin. The ISTE Standards are open-ended and support higher-level thinking and real world problem solving. Librarians are also open and support higher-level thinking and real world problem solving. Sounds like a great match. .I came across the name Andy Plemmons in a blog by Katie Beaudet. I liked what Katie had to say about him, so I went to investigate for myself. Andy Plemmons is the media specialist at David C. Barrow Elementary School in Athens, Georgia. It’s truly exciting that we have such energy-charged professionals in close proximity, not to mention that we can actually communicate and interact with them. He had me at “grounded." Many of us have tiptoed lightly around the political situation in our country. Rather than ignoring these issues, Plemmons has worked to help his students become informed and speak out. “There’s a lot going on in the world right now and it’s easy to get overwhelmed by the many current issues being debated and decided in our country and around the world,” Plemmons writes. See “Letters for Justice” for an excellent example of this. Student voice is evident throughout. After all, isn’t it our job to help students become free thinkers who can investigate and make decisions? He shares his own important perspective, “As a teacher librarian, it’s challenging because I want to support all students and families knowing that I might not personally agree with their perspectives.” Yes, we struggle to remain impartial and this statement echoes that difficulty: “I make sure that I step back and listen to the students, support their research and perspectives, and check my own beliefs.” In a nutshell, I think this is one of the most important aspects of a librarian’s job. I am always in awe of school librarians who are active out in the world in organizations like ALA and AASL, presenting at conferences, publishing, leading professional development, advocating for the profession and freedom of information. The blog inspiring to read. Expect the Miraculous is about much more than technology; it is about applying all that we learn in order to be a media specialist. Students learn to ask questions, investigate, and speak out as they learn to use 21st century tools. Lots of inspiration here. Highly recommended. ​Recently I decided to look into assistive technology apps using speech-to-text recognition. This is especially important for me since I've just had surgery and can't use my right hand. I know that Universal accessibility is very important in a public setting, and now I'm finding it out first hand. 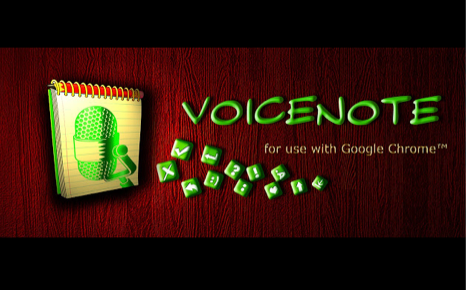 The first tool I looked at is a Chrome extension called Voice Note II. It is very easy to use, similar to using a voice recorder. The speech recognition is so accurate that I hardly needed to make any corrections. Voice Note II allows the user to choose a language, to refining the voice recognition even further. Choices for English included Canada, New Zealand, Australia, South Africa, India, United Kingdom, and the United States, this helps the app discern the user's accent to increase accuracy. Voice Note II will pick up side conversation, making it a little tricky to use in a busy classroom. Punctuation can be dictated or chosen from icons on the desktop, similar to using Word. The switch from using voice recognition to using the keyboard is seamless, making corrections fast and easy. Voice Note II is so easy to use. It is an excellent choice for student use. Most students can say a lot more than they can write or type, so Voice Note II could help them to express themselves in a much more complete way. Using Voice Note II could encourage free flow of thoughts in journalling. Also, spelling is not an obstacle in using this app - and it’s free! Speech Texter is another free extension I explored. The English - United States language selection came up automatically. A drop down menu also appears with voice-activated punctuation options. Formatting options are listed across the top of the typing area. Some of these are voice-activated as well. The voice recognition aspect of this app is even more sensitive than that of Voice Note II. However, I found that my accent was more of a problem with Speech Texter. Speech Texter interpreted a word like bold to be bald when I said it. Speech to text aps for the iPad include Dragon Dictation for which there are several different versions. The speed of dictation is described as being five times faster than typing on the keyboard. At this time the developer needs to update the app so it will work on future versions of iOS. Pearltrees is a digital curation site I discovered through reading a classmate’s digital curation assignment. Pearltrees features a unique visual interface that allows you to drag and organize collected URLs, and other digital objects that themselves can be further organized into collections and sub-collections. ​This is a Pearltree that I made about Pearltrees! 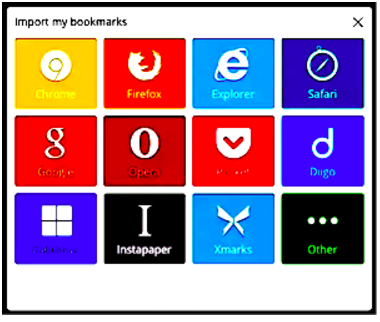 You can easily import bookmarks, or upload and organize all your Twitter and Facebook posts. Pearltrees has the ability to "super-embed" a pearltree into another website. In turn, these are updated dynamically whenever the original pearltree is changed within the Pearltrees website. Pearls are added through the use of a “web clipper” similar to the pinning button for Pinterest. You can place the item in a collection or subcollection or put it in your “drop zone” to be sorted later. You can also drag and drop photos or files into a collection. There is also a button to synchronize your account with twitter and facebook. Pearltrees Education Workspace is a private/secure workspace dedicated to a school in which teachers and students can share educational resources. Teachers can create their own textbooks, a flipped or collaborative classroom, individualize learning. Each person has 1 TB of storage to organize and share digital educational resources. Pearltrees will handle creation, installation, updates, editing and archiving of Web pages offline with daily backup, implementation and development of uses throughout the year with a training program corresponding to the school’s objectives, monitoring and support. They offer a “data property guarantee” that collections will be available beyond the subscription period. All this for $3 per student per year, with a clause for “money back” if not satisfied. The minimum price is $600, which is the equivalent of 200 students, 25 teachers, and five administrators. Interesting new apps, my favorite innovations in education, good stories and tall tales.